"The F&B market in Hong Kong is so competitive. In my opinion, it’s the most competitive in the world. A lot of people underestimate the quality and creativity found here,” says Alexis Offe, who founded Meraki Group with his sister Laura. 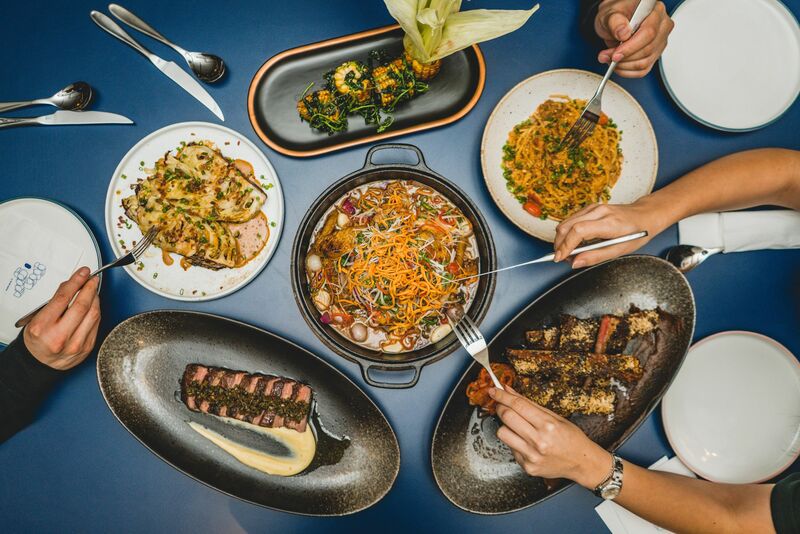 The duo are behind Brazilian-Japanese street food spot Uma Nota in Soho and modern Middle Eastern Bedu in Central's happening Gough Street hub. “In Hong Kong you need to deliver every single day, because you're only as good as you were yesterday. It definitely gives you that competitive edge,” he says. It’s this Hong Kong grit that the Offes have taken with them to France, where their parents are from, opening Uma Nota in Paris in summer last year. "I think that because it's so competitive, the concepts here in Hong Kong have a lot more detail. Everything is thought through, from the design to the food menu, to the collaterals, to the packaging, to the music. It's an experience in itself,” he says, which he feels wasn’t the case in Paris until a few years ago. “If you would've told me four years ago to open a restaurant in Paris, I would have said no, because I didn't think the market was ready.” The idea of a “concept” restaurant, with a strong storytelling aspect has made them a leader in Paris – Uma Nota has been nominated best new casual dining concept by French industry awards Les Palmes de la Restauration. “[Being in a heritage building] is very challenging. There are a lot of things we couldn't do with the façade. There's a lot of things inside the restaurant, like the structure itself, we needed to not touch it. The floor had to be as it was.” Being a two-storey restaurant with a wraparound mezzanine, however, they have the luxury of space, which is always a delight to space-challenged Hong Kong restaurateurs. He and his team opened The Guild in Singapore’s vibrant Chinatown in May last year, and after nine months, they’re getting into the swing of things. “In Singapore, fortunately, we’ve had a very strong positive perception,” he says. Part of the success has been to identify a need in the market, he explains: "I think in the Singapore bar scene there are these incredibly high-quality cocktail bars, but I sensed that there was a bit of fatigue among people, that every cocktail bar [was] trying to outdo the other in terms of pure showmanship. I think The Guild represents high quality without any of that superficial nature of things. We wanted to create a solid place that can be around for a long time. I think this is allowing us to find our own space”. With a goal of being the leader in the Asian craft beer scene, Young Masters’ expansion is deliberate. “Within the resources that we have, we decided to select a few cities that we wanted to be present [in]. We thought we need one place in Southeast Asia, and something in Mainland China. We wanted to not just send some beer to a distributor. We wanted to do it properly and have our own kind of way of presenting, for the full experience.” The Asian craft beer scene is still nascent, but in Shenzhen it’s close to non-existent. Still, Dugar says they’re in it for the long haul. “In Shenzhen, the focus for us for the foreseeable future is sticking to our guns, continuing to do what we believe in, while educating the market by playing a role in that process [of introducing craft beer to the locals]. It's happening. It's an organic process which will take time.” In fact, he says a few Shenzhen hotels have just placed orders, simply because a representative of the hotel happened been introduced to the beer by visiting Goon Goon. Perhaps a more obvious way of exploiting Hong Kong’s strengths is exporting Cantonese food into overseas markets, so it's little surprise that more than one Hong Kong restaurateur has attempted it. Mott 32 is in Vancouver, and more recently, Las Vegas; Duddell’s opened in London; and Canton Disco has brought a slice of Hong Kong to Shanghai. Syed Asim Hussain of Black Sheep Restaurants, who have brought Canton Disco to Shanghai, concurs: "Even going into a new neighbourhood in Hong Kong for us presents its own unique set of differences, so with the Shanghai opening we were really sailing into unchartered waters.” The group has emerged in recent years as a leader of the “concept” restaurant genre in Hong Kong, and for this first Shanghai outpost, Christopher Mark of Black Sheep Restaurants says it’s "a celebration of the disco era”. “We took it back to the very beginning with a subtle nod to Studio 54 and Ian Schrager [the designer for Edition Hotels, in which Canton Disco is situated]. We always try to tell a story that is unique to the space and with this project we wanted to link it back to the Edition brand”.